The Ontong Java Plateau (OJP) in the western equatorial Pacific is the largest submarine plateau on Earth (~1.86 X106 km2). Despite its immense magnitude and significance to our understanding of mantle processes, submarine sedimentation, and tsunami risk in the western equatorial Pacific region, the plateau remains enigmatic. In October 2014, scientists aboard Schmidt Ocean Institute’s RV Falkor (FK141015) mapped for the first time the seafloor surrounding Ontong Java Atoll (Solomon Islands) and Nukumanu Atoll (Papua New Guinea), situated atop the OJP. 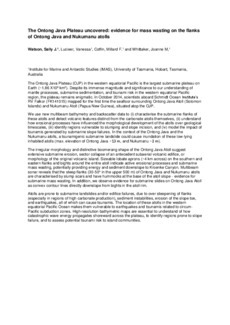 We use new multibeam bathymetry and backscatter data to (i) characterise the submarine flanks of these atolls and detect volcanic features distinct from the carbonate atolls themselves, (ii) understand how erosional processes have influenced the morphological development of the atolls over geological timescales, (iii) identify regions vulnerable to slumping and slope incision, and (iv) model the impact of tsunamis generated by submarine slope failures. In the context of the Ontong Java and the Nukumanu atolls, a tsunamigenic submarine landslide could cause inundation of these low-lying inhabited atolls (max. elevation of Ontong Java ~13 m, and Nukumanu ~2 m). The irregular morphology and distinctive boomerang shape of the Ontong Java Atoll suggest extensive submarine erosion, sector collapse of an antecedent subaerial volcanic edifice, or morphology of the original volcanic island. Sizeable lobate aprons (~4 km across) on the southern and eastern flanks and bights around the entire atoll indicate active erosional processes and submarine mass wasting, potentially providing energy and sediment downslope to Kroenke Canyon. Multibeam sonar reveals that the steep flanks (30-50° in the upper 500 m) of Ontong Java and Nukumanu atolls are characterised by slump scars and have hummocks at the base of the atoll slope - evidence for submarine mass wasting. In addition, we observe evidence for submarine slides on Ontong Java Atoll as convex contour lines directly downslope from bights in the atoll rim. Atolls are prone to submarine landslides and/or edifice failures, due to over steepening of flanks (especially in regions of high carbonate production), sediment instabilities, erosion of the slope toe, and earthquakes, all of which can cause tsunamis. The location of these atolls in the western equatorial Pacific Ocean makes them vulnerable to earthquakes and tsunamis related to circum-Pacific subduction zones. High-resolution bathymetric maps are essential to understand of how catastrophic wave energy propagates shoreward across the plateau, to identify regions prone to slope failure, and to assess potential tsunami risk to island communities.